Robin Williams was an actor. That was his calling, and that was his gift. Williams trained in the theater, and attended Juilliard, where he honed his knack for impressions and pretense. But because Williams could invent faster than any writer could write, very early in his career he took his talents to the stand-up circuit, where for however long his set lasted—ten minutes, an hour, more—Williams would turn his own life into an uncommonly complex act of theater. Williams would speak honestly about his relationships, his addictions, his desires, and his perspective on society, culture, and politics. The observations rarely changed much. What changed was the way Williams illustrated them: through characters, references, and riffs that he improvised, inspired by the moment. Williams was found dead today, at the age of 63. The cause of death hasn’t been confirmed, but the early reports are that Williams died of asphyxiation, which suggests that his death was a suicide. If so, this news is startling, but not entirely surprising. Williams had battled addiction and depression throughout his life, and he was never shy about discussing his problems—in interviews or on-stage. But just because Williams was a troubled person doesn’t make his loss any less devastating. Williams was a phenomenal talent, and as much as any issues he had in his personal life, one of Williams’ great tragedies (and ultimately great triumphs) was how he had to fight over and over to squeeze all that he could do into the restrictive confines of a movie or a television show. Williams had his first great success on TV, in the sitcom Mork & Mindy, which ran from 1978 to 1982. As an alien on a mission to understand Earth, Williams had the freedom to be silly and to do funny voices, while exhibiting the kind of sweetness and compassion that would become one of his hallmarks as a performer. Mork & Mindy made Williams a household name, and he built on that popularity with talk-show appearances and stand-up specials. Any time that Williams was on television—broadcast or cable—he was a one-man special event. No one watching at home or in the TV studio knew exactly what Williams was going to do, because Williams would respond to the energy in the room, and to whatever popped into his head. For a long time, the big debate about Williams was whether anyone in Hollywood would figure out how to capture his electricity or creativity on film. As a movie actor, Williams’ resumé is dominated by films where we was either manic and improvisatory (such as The Survivors, and as the voice of Genie in Disney’s animated Aladdin) or movies where he seemed to be going out of his way to be somber (such as The World According To Garp, One Hour Photo, and Good Will Hunting, the latter of which won Williams his lone Oscar, for Best Supporting Actor). 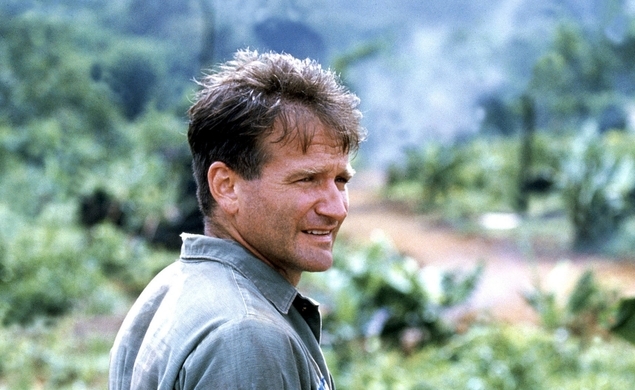 On the rare occasions when Williams got the chance to be both funny and sincere, the results were often something special, resulting in some of his most beloved roles: as an motormouthed, anti-establishment Army DJ in Good Morning, Vietnam; as an inspiring English teacher in Dead Poets Society; as a mentally ill homeless man in The Fisher King; and as a dad who poses as a nanny in Mrs. Doubtfire. Because Williams worked a lot, he made more than his share of clunkers; and he had a weakness for broad comedies and sappy feel-good fare that at times damaged his reputation with critics. The words “featuring Robin Williams” in the credits weren’t always a mark of quality. But in a way, that’s what makes the sheer number of great Robin Williams screen performances so staggering. In addition the films mentioned above, Williams was great in Robert Altman’s Popeye, where he took a mumbly cartoon character and still instilled it with humanity; and he was terrific as a fussy drag-club owner in The Birdcage, as a cold-hearted crime novelist in Insomnia, and as a struggling writer exploiting personal tragedy in World’s Greatest Dad. Williams also popped up often in memorable bit parts, in The Adventures Of Baron Munchausen, Dead Again, Hamlet, and more. Returning to television, Williams spent last year working on the underrated CBS sitcom The Crazy Ones, playing an advertising executive dealing with a bushel of very Williams-like personal struggles; and he played another version of himself in a beautifully elegiac episode of Louie. Just when it seemed that Williams was going to descend into hackdom, he’d do something amazing on-screen, and would remind his longtime fans why they loved him. The line between Williams the man, Williams the stand-up comedian, and Williams the thespian weren’t always clearly defined, which may be why he didn’t always get his due as an actor. But he was beloved by the people who worked with him, who spoke of his generosity and his willingness to keep everyone on the set entertained. And Williams thrived in the spotlight, where he got to take everyone he’d ever met, every experience he’d ever had, and every spontaneous idea, and turn it into a performance. There’s never been another actor like him. There likely never will be again.